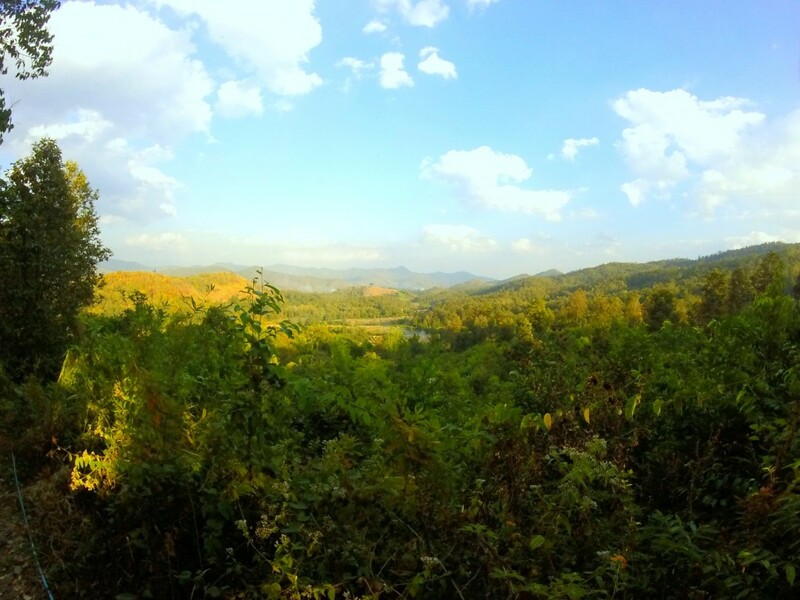 Chiang Mai is surrounded by mountains, jungle and rivers, making it the perfect base to do a trek from. Like many before us this was one of the main reasons we came to Chiang Mai. 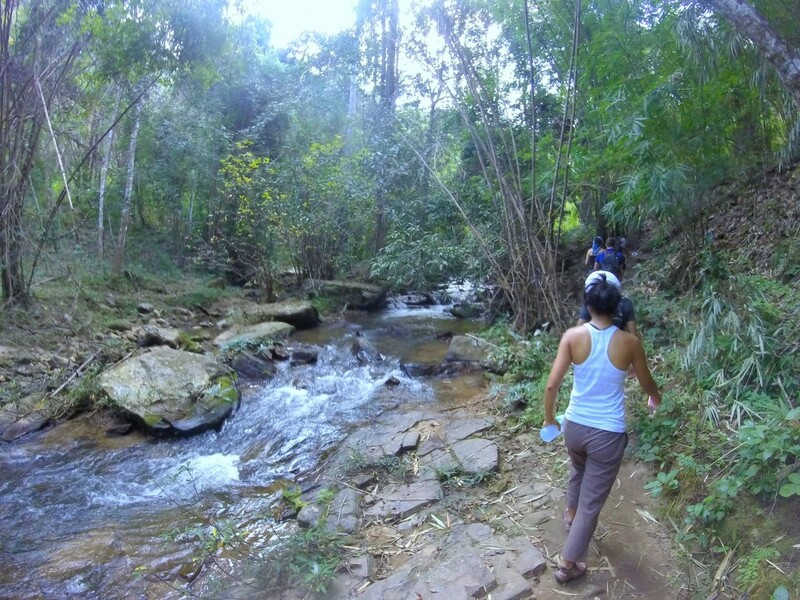 When looking at trekking in Chiang Mai there are so many different options! There is literally a trek for every budget, level (stamina!) and duration. I’m not sure why but I left it really late to book this part of our trip. I tried to read as much as I could before we went to find out what kind of trek to book, what to avoid, how much they should cost and what to pack. 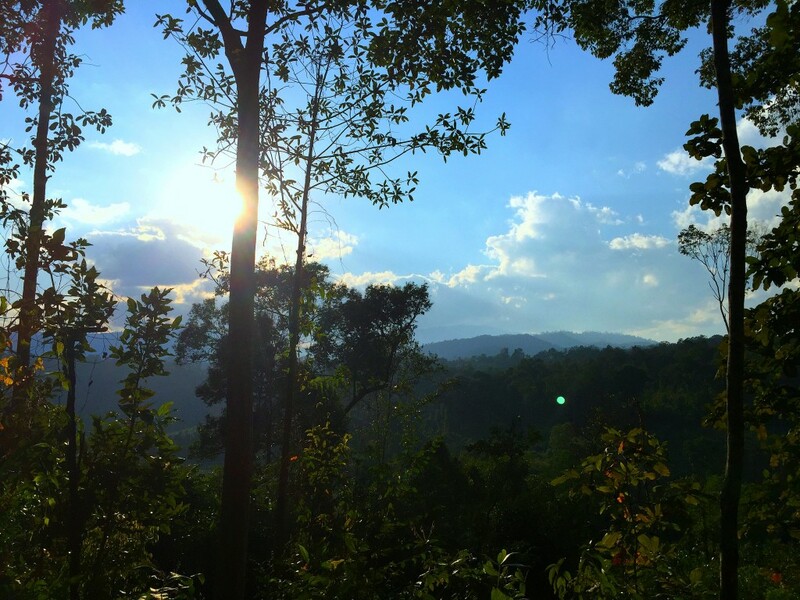 So here are my tips and stories from our trekking in Chiang Mai! I was really excited about this part of our trip but also super nervous. I’d never done anything like this before. So I think I was putting off booking it because I didn’t want to choose the wrong one and not enjoy it. I didn’t want an extreme trek because I’m pretty unfit and well, I really hate insects and I was scared I wouldn’t be able to do the whole thing (why the flip go into the jungle then!? Face your fears and all that), but it had to be interesting enough for D. We also decided to avoid elephant trekking (there are only a handful that are ethical), we didn’t fancy rafting and we knew we wanted to be part of a small group. 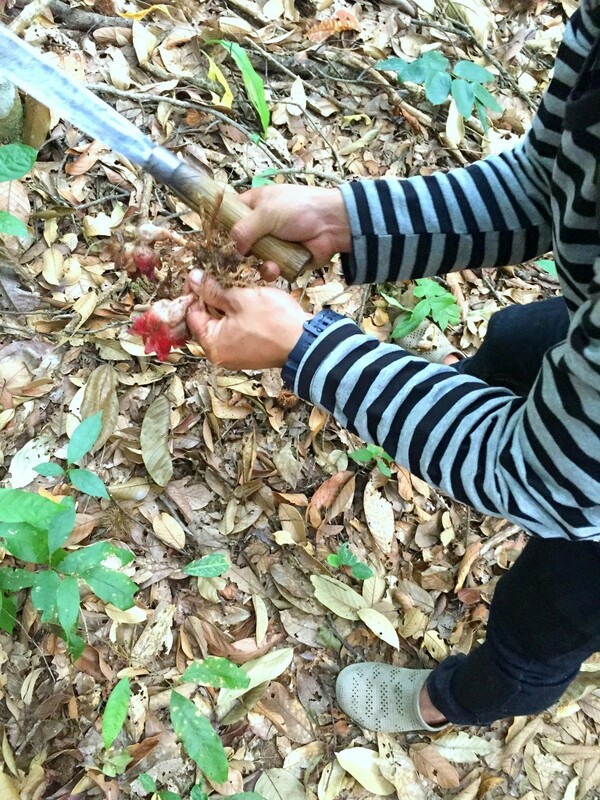 We wanted to trek with minimal impact on the environment and local tribes, seeing it all as authentically as possible and hopefully getting a glimpse into life in the jungle. A couple of days before we flew I decided to email Pooh Eco Trekking as they are renowned for great eco treks and get rave reviews. The response: fully booked! And we didn’t have any lee-way on our dates. D was not a happy bunny. Oops! So in the end we didn’t book until we got there. For us this was a bit risky as we only had one day in Chiang Mai before we had scheduled to go on a 2 day trek. If you are more flexible with your time in the region then I do suggest booking when arriving in Chiang Mai because all the websites list the same things and so it can be hard to differentiate. Also, many of the hostels and hotels will organise it all for you – just make sure you have a list of want you want included ready. So, how did we find our trek? We asked in a cafe close to our hotel and they pointed to a little tourist shop. We walked in and were greeted by the friendliest lady! I’m so glad we went in! We listed what we did and didn’t want and that we wanted to do a 2 day 1 night trek. It’s was her family’s business and most of them still live in and around the jungle and they were running a trek the next day with just a handful of people. It would be lots of walking and we would get to spend the night in her family’s village. It sounded perfect! It also only cost £50 per person. We booked the Maewin and Family Trekking Tour. – Bed and blankets. The hut had thin mattresses in pairs under a mosquito net. Our trip made me realise more than ever how travel helps to open your eyes and face your fears. It pushes the boundaries of your normal day-to-day life. We were picked up at 7am from our hotel then proceeded to pick up another 3 people (an Australian couple and one American girl) before driving out of Chiang Mai towards the jungle. We stopped briefly at a market to pick up water and a couple of supplies for dinner. Then back into the van and onwards. We climbed the hills and after about half an hour we stopped and there began our adventure! 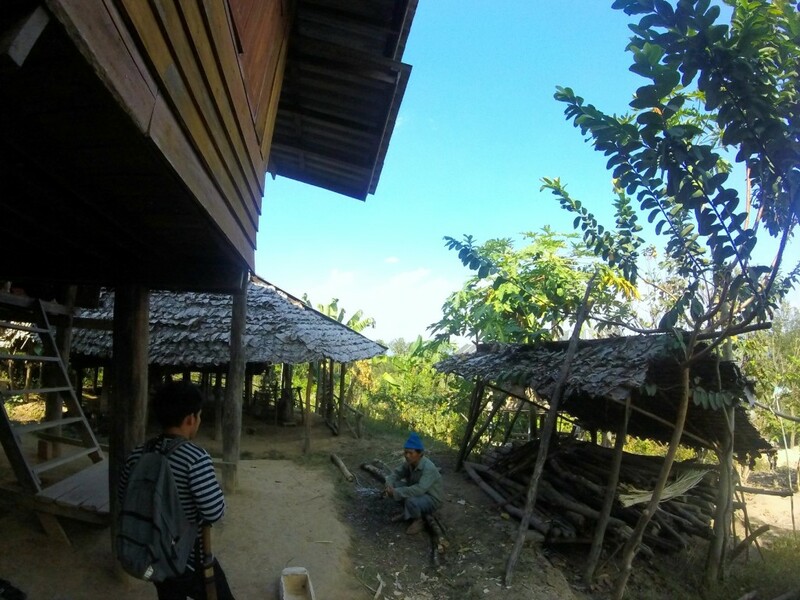 At first, our guide Peck seemed quite shy and as we began to walk through the fields towards the forest, he tried to point out different plants, termite mounds and to be honest we thought this was going to be a very long two days. Oh how we were wrong. Peck was the best guide we could have hoped for! Having only began to learn English two years previously, we soon found out he was only 23 and had lived here all his life. He knew everything about the land and filled us in on what plants to use for which remedies, and climbed the trees continually. I don’t mean to sound incredibly cheesy but he really was at one with the jungle. All of it is his home. It was just incredible to see. We walked over 40km over the two days and I have to say after a couple of hours into the trek I wasn’t really loving my husband for making me do it. When we stopped for lunch I was shattered and didn’t know how I was going to get to the end of the day! I also was feeling nervous about where we would be sleeping. Honestly, I am the biggest whimp out there. I’ve never even been camping! But, something clicked after we set off post-lunch and I just began to love it. I realised I had to embrace every moment – You are in the jungle Vicky. You are so lucky to be here Vicky. You can so do this Vicky. You. Are. In. The. Bloody. Jungle. Vicky. It was definitely a challenge for me at times because the inclines were hard but when you look around and realise where you are you soon forget your thighs hurt a little. 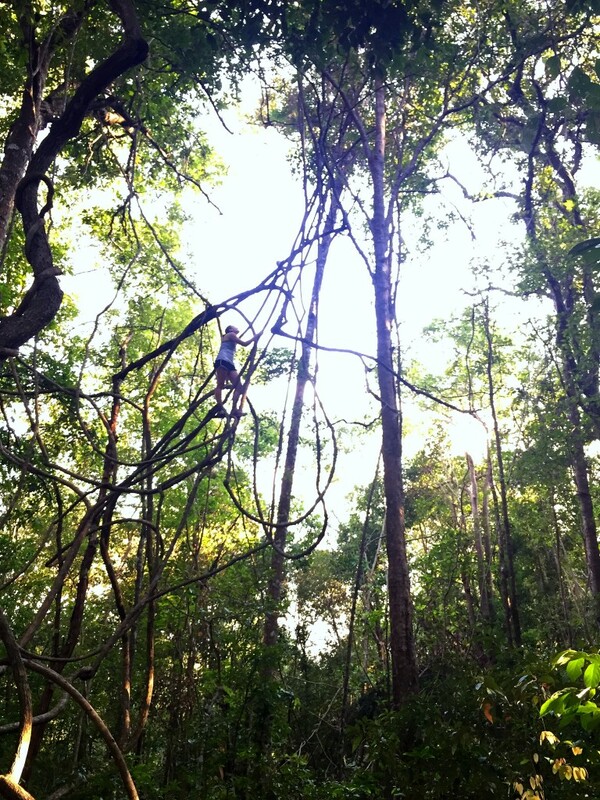 By the end of the day we were wading through thick jungle, with Peck at the front hacking down branches to get a path through! We arrived at our camp for the night sweaty and tired, but I also felt exhilarated! 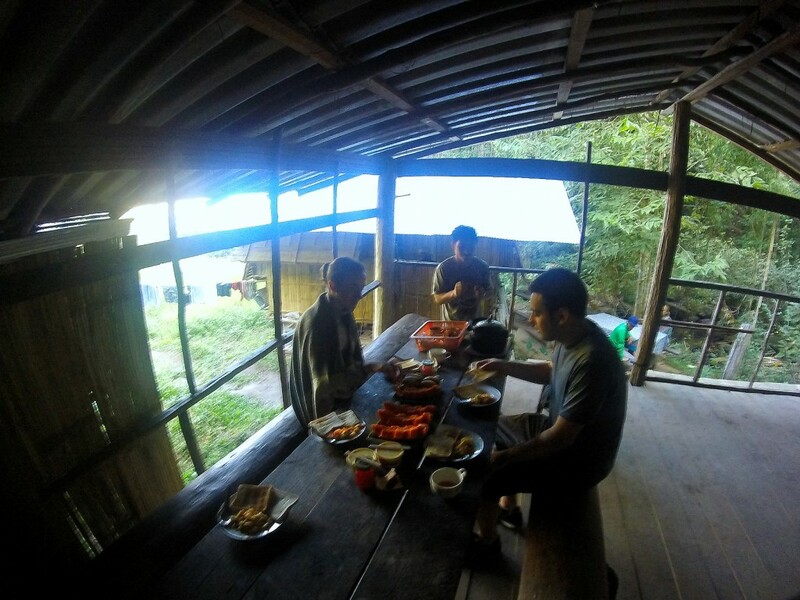 We were staying at the base of a waterfall, there was a hut to sleep in, a hut to cook in and a shack to eat under. We washed in the waterfall – watching Peck doing summersaults of the rocks (knowing where the deep pools were). Peck cooked a simple but delicious meal with his father. On one stove they cooked two curries and a soup. The flavours were wonderful. 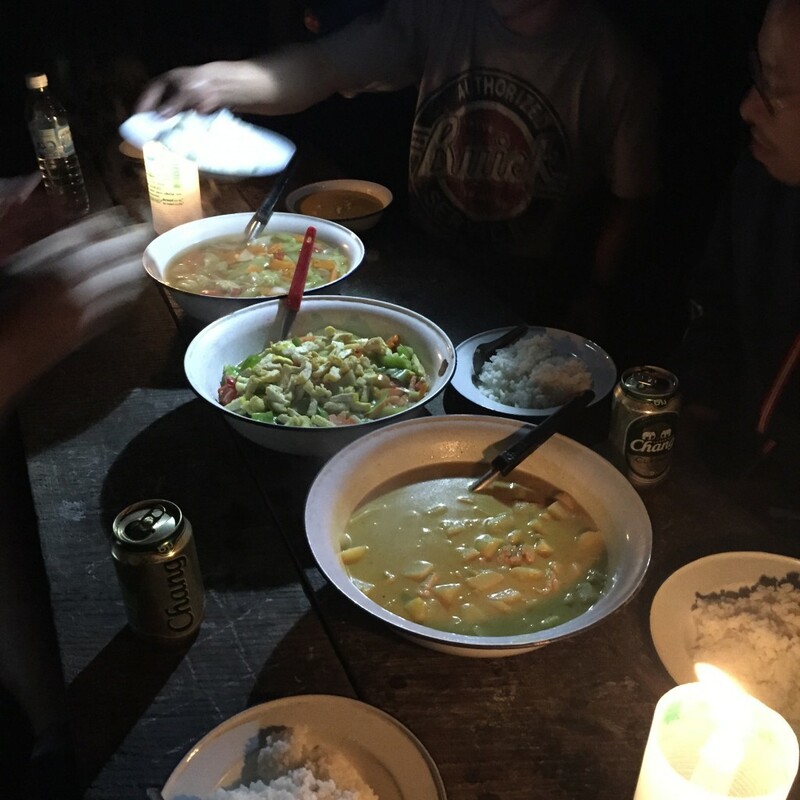 We ate by candle light with a cold Chang beer, chatting away to our new friends on the trek. After dinner we shared their home-brew whisky and Peck’s father played music for us. Such a special evening. Sleep wasn’t too bad, although sleeping by a gushing waterfall all night really messed with my dreams! And it did get quite cool – if going in the dry season be sure to bring some warm clothes. We rose at about 8am to fresh eggs and coffee and began our trek. 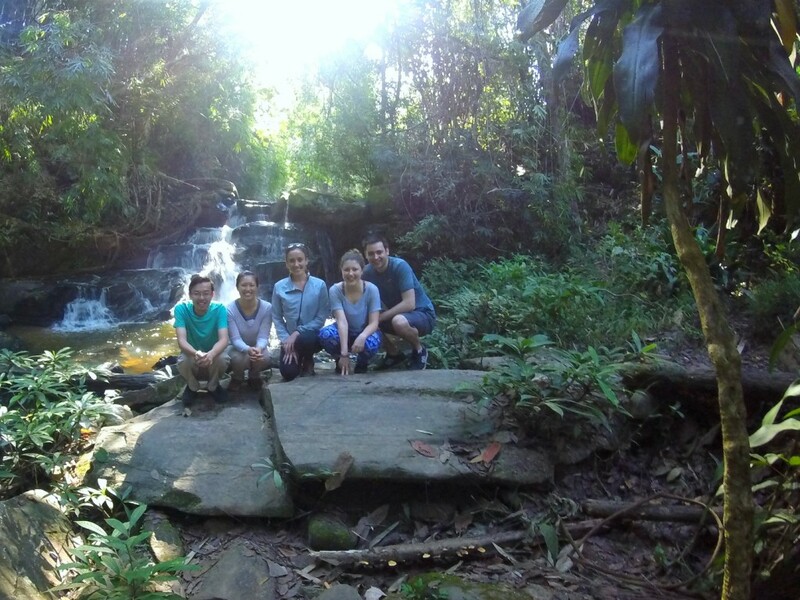 We met Peck’s family, walked to a beautiful high point to see stunning views, swam in some waterfalls, saw some intrigued buffalo and headed out of the jungle. Peck made us chop sticks from bamboo he hacked down, as he walked (!) for us each to take. 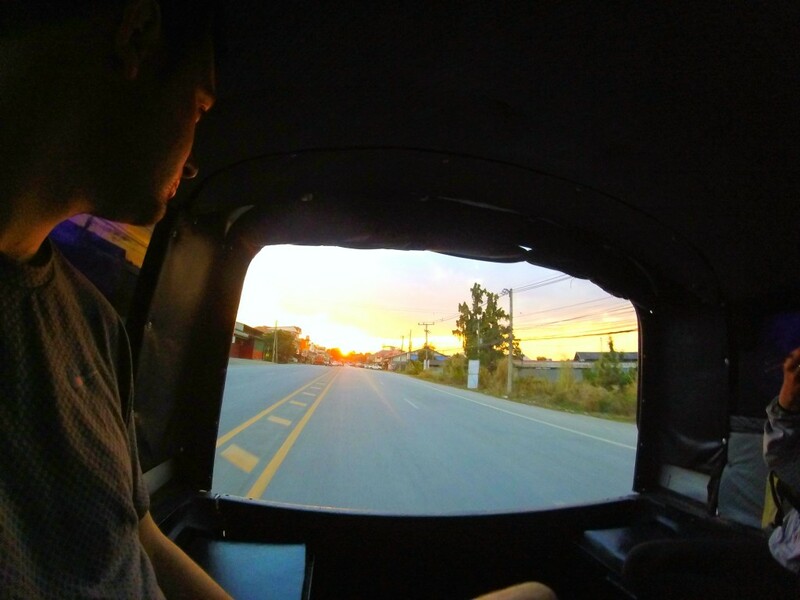 As we drove back to our hotel, watching the sunset out the back of the van, I was trying to process everything we had done and seen. 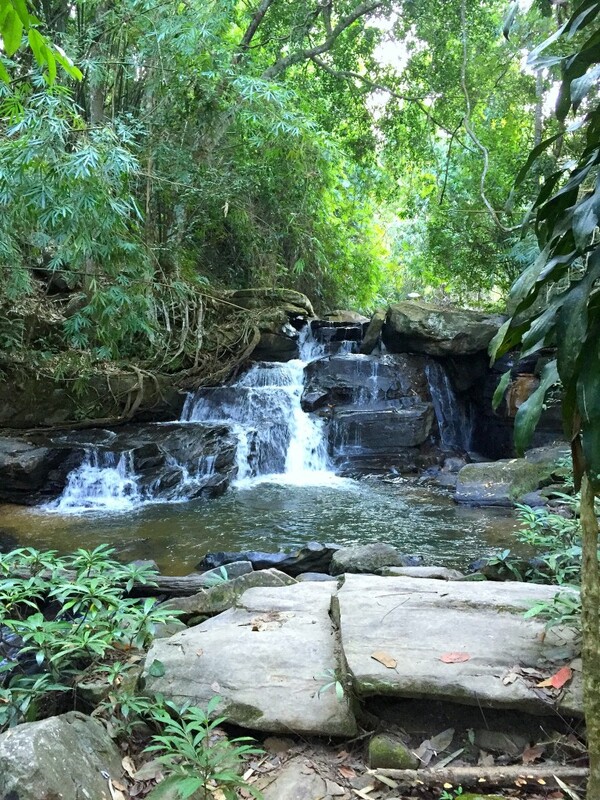 I had spent a night in the jungle and loved it. I never thought I would, but I embraced it, eyes wide open, and experienced something very special. – Avoid rainy season for obvious reasons. Sometimes the rain is so bad the tour won’t run and if it does I can imagine it’s a little precarious! – It does get cool in the evening. Chiang Mai is far north and during the dry season (their winter basically) which is when we were there, although it was still very hot in the day, it was cool in the evening. I wore a long top and jumper with trousers to sleep in. – Ask how many will be in your group. Some of the shorter treks run with up to 30 people on! – Most of the treks booked through the mainstream companies include rafting and elephants. – Be aware that most of the elephant ‘trekking’ offered are not ethical and you’ll see them chained up. If it matters to you, seek out the few ethical ones. I could go on and on about all the wonderful memories I have of our trek and the moments that made it so special to us but I realise this is an essay, so if you got this far well done and thank you for reading! 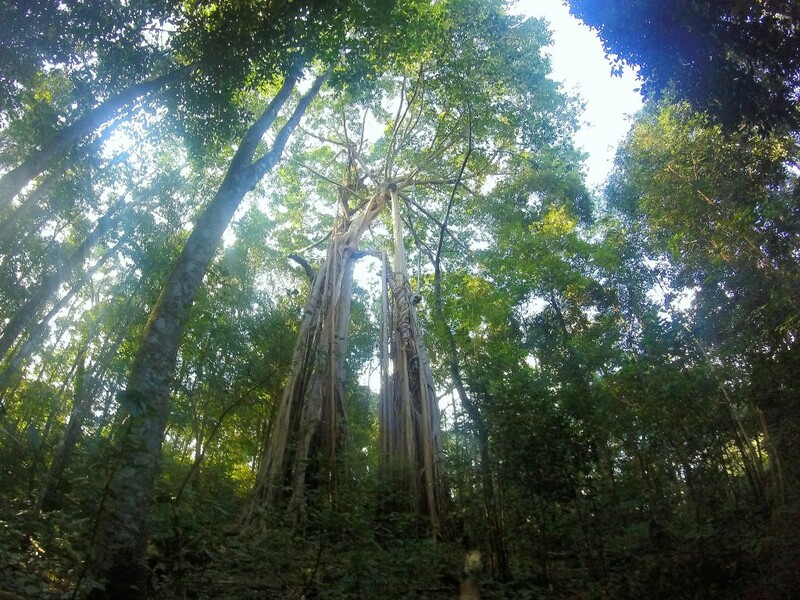 Have you been on a trek in Chiang Mai? What’s your biggest fear when travelling? This trek looks amazing. I’m gutted I didn’t get to do this in when I was in Chiang Mai (due to time limitations) would of been an amazing experience.